We all need to get away from it all. The job, people, even family can pull on your last nerve. Let's Escape! 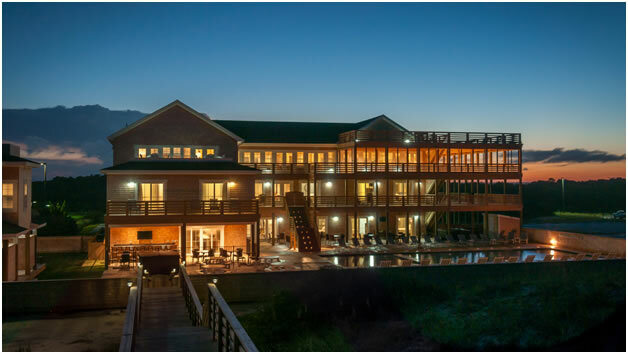 For many years, Charlotte has hosted retreats. They have now become known as Escapes. The reason for this is that they are a relaxed, fun, laid back experience like no other retreat available. Get relaxed with a massage, find a nook and read, walk on the beach.... oh, and then there is the friendship, eating and yes, sewing! What started out years ago in a hotel in Virginia Beach for her customers has turned into a much different time. Wherever Charlotte moved so did the retreat. For the past 8 years, it has been in the Myrtle Beach, SC area. The house was wonderful with 10 bedrooms, but so many others wanted to join us that the search for an even larger house began. With the search on, a new house was found in NC. 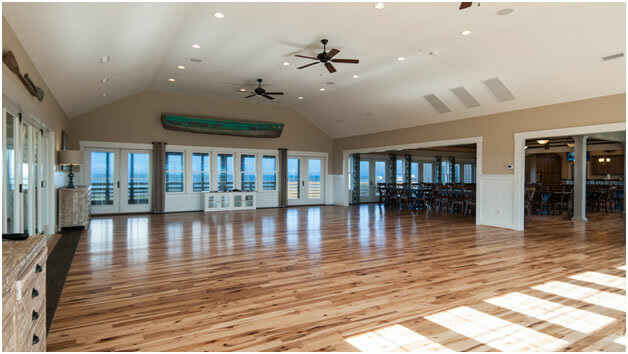 It is a huge house with 28 bedrooms, 2 hot tubs, a ball room, a reception hall, wrap around decks, sitting areas, fitness room, shuffleboard, theater room that seats 21 and a private walkway to the beach. There is also very fast Wi-Fi. And like all things Charlotte, there will be laughter, good food and great fun. This is a perfect way to do what we all need now and then. . . escape. This is not a simple retreat and it is not for everyone. Since it happens in a house, it is important to realize each person makes up a very crucial part of the whole event. No one is better than anyone else, everyone is expected to have a great time, get along with others and to pitch in and help make this the best Escape ever! If you come with friends or a relative, we hope you connect with others because it is so important to the climate of the whole house that everyone gets along as a family sharing the house. There will be no political or religious talk here and no tolerance for rude behavior. The house is located in a remote area, unlike anything I have offered before. It is in Corolla, NC. To get there you have to drive. So, if you are flying, you will first fly to Norfolk, VA (ORF) and rent a car. From the airport, it is about a 2-hour drive. We hope to be able to coordinate this between those flying in so others can hitch a ride/help with the trip. The main goal of all Escapes is to relax. Some Escapees didn’t know how not relaxed they were until they got to the Big Beach House! Also, we want you to make friends… and the quilt will be the best bonus of all. The cost of the Escape is either $1400 per person, double occupancy, this includes your room (all have private baths), laser cut kit, meals and so much more. NOTE: The 2019 Escape is full. 2020 Escape is being planned and it will be in Biloxi, MS. Details to come. 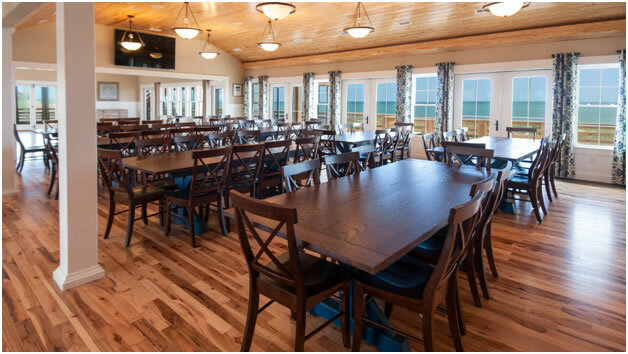 Charlotte Angotti presents Pine Island Lodge in Corolla, NC February 18-22, 2019. The house is huge and just perfect for such a wonderful event. We will have a gigantic room with tables and chairs all ready for your sewing machine. Your supply list will be pretty short because we are going to make a laser kit just for this event. Everything will be cut out and ready for you to sew. Monday after 3 we will begin letting you into the house. No one will be allowed in before that so we can set up things and get the house ready for you. Then a welcome party will happen at 6, with dinner served at 7. Tuesday the kit will be handed out at 9 am and sewing will begin! The meals will be catered and will include lunch and dinner. Breakfast foods will be available…coffee, tea, juices, muffins, oatmeal, yogurt and such, along with bacon and eggs for you to cook if you would like. Wednesday and Thursday will be sewing, laughing, eating and enjoying the beach, the house and making friends. Departure will be before noon on Friday. If you would like more information or have any questions, please email Linda Kelley @ linda4705kelley@gmail.com she will be happy to help you by sending you a registration form. This will be limited to 40 Escapees, so please don’t hesitate too long. Hope to see you there! Escape with me!